It's FRIDAY!!! YAY!!! And yes, my friends, there are jelly beans involved. Just say'n. We have a busy weekend ahead looking at apartments, as we will be moving in less than two months! YIKES! You can imagine how much fun it will be to pack my studio...you've seen my WOYWW pictures. I should probably start now. HA! 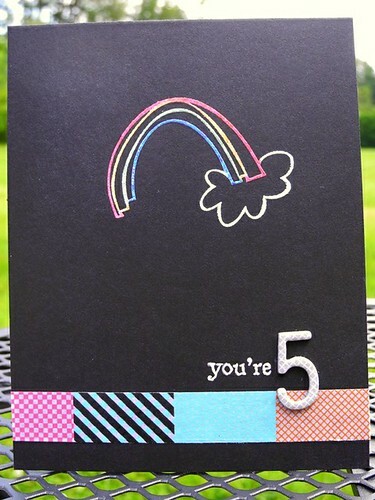 I have a fun card to share with you today from Friends with Flair Friday over at Unity! I created this one with the super cute rainbow from the Sunny Happy Skies set heat embossed with snow embossing enamel from Stampendous! I then used markers over the enamel to add the color. LOVING this technique! I masked out part of another sentiment from the Everyday Sayings set to get the 'you're' and then added a bit of wahshi tape and a 5 from the Amy Tangerine Thickers line. SUPER fun! I hope you have an absolutely FABULOUS FRIDAY!!! I intend to do so, that, my friends, is for certain. Oh you colored the embossing with markers!!! Genius! 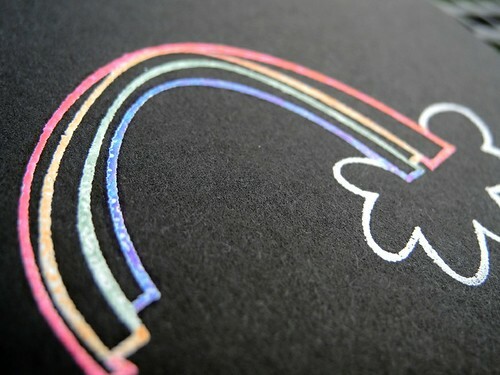 I was wondering how you got each line in the rainbow a different color. Cute, cute card, Girl!! I must get some Washi tape. oh this is sooo cute! 5 is my fave number. Love this! so cute Jingle!! love it!!! I am loving that rainbow! I am going to add it to my inspiration list. Great job! awesome colouring technique!!! I will have to give it a try. Such a clever way to add colour. That is a cool technique for sure, love the satmp too! Wowza..love this...You must have a steady hand, Jennifer! I'd have marker all over that black cs. What a great card! I love the bright color against the plain black. Looks awesome!! best of luck packing up your crafty goodies! !